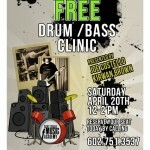 Please bring your son, daughter, friend, husband, wife, anyone interested in music, to this free clinic. A lot fo work is going into bringing you a clinic that demonstrates the relationship between the drummer and bass player in the band. Myself and Kirwan Brown (bass guitar), Jason Brown (guitar) & Dan Puccio (sax) with perform a bunch a cool tunes that with challenge our abilities as both individual players and players as part of the rhythm section unit. Reserve your seat today…they are definitely filling up!! Please call John at (602) 751-3537 TODAY!! "Joe Costello", Dan Puccio, drum lessons, Drummer, drums, Free Clinic, Jason Brown, Kirwan Brown, Scottsdale Music Academy. Bookmark.